23.5 kg. , 51.8 lbs. I just refinished my jet sled with a slick bottomcoating and wanted to test it out going over shallow sand bars. I took that Monday off of work to go dive and test out the boat. I was messing around diving different spots than I normally would be diving and seeing tons of common carp and no striped bass. So I jetted up slide over this pebbly bar about 6 inches deep, as I was coming into some deeper water I saw a huge bass jet off around the boat, so at point I went up about 100 yards banked the boat walked down to where I saw the big fish. I Loaded my custom paduak/purple heart roller speargun that I made some seasons before, secured the slip tip snugly and sliped into the 1 foot of water went out about 15 feet where there was a nice declining drop off. I took my breath and proceded down about 7 foot. I was laying facing out on the slope with the gun tucked back. I saw one smaller striper about 20lb that came in to check me out. Then coming in from the left to the right was a freaking slob striper, all I could do is just hold still and let it come into my shot zone. With it being so shallow practically anything would spoke the fish. It started quarting away and I had to take the shot, I pulled the trigger and hit right where I was aiming for 6" behind the head above the spine. Then the fight was on, my speargun doesn't have a reel so it was just me and the giant. I was kicking as hard as I could trying to relieve the tension on the tip, but that fish Had so much power almost took the gun from my hand multiple times, then the line went limp and I thought the tip pull out. I was at a moment of heart break for a split second then the line tightened the fight was back on draging me up, down in circles and around tree snags. Finally the fish subdued and I was working off the line at that point I knew it was all over. I ended up about 25 yards down below the boat. I've fought quite a few fish in the 40lb ranges but I'll never forget this fish. Loaded up the fish shot back to the ramp and took it to get a weight on it. 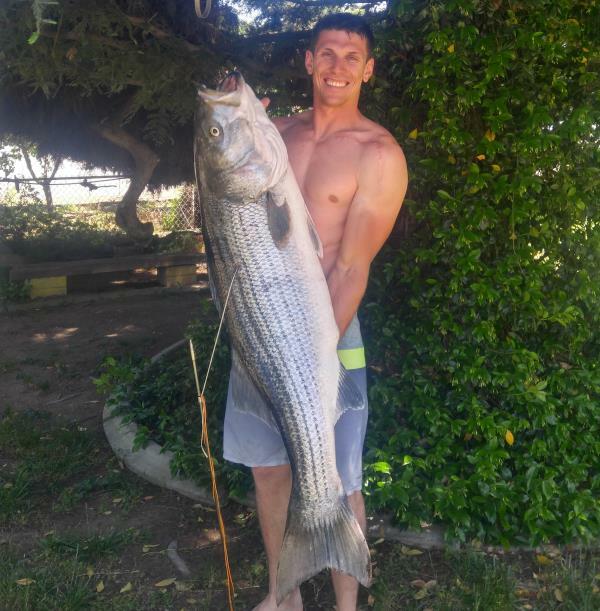 When that scale said 51.9lb I was ecstatic the slip tip was still inside the Fish after weighting the tip and deducting its weight the fish top in at 51.8lbs I had the new world record and a california giant bass going up on the wall! !